Why settle for inferior companies when SERVPRO can provide your Baldwin home with outstanding water loss drying methods? We can salvage building materials like hardwood flooring and save our customers money and disruptions. Demand the best! SERVPRO is available 24/7. Unexpected events can happen at any time. 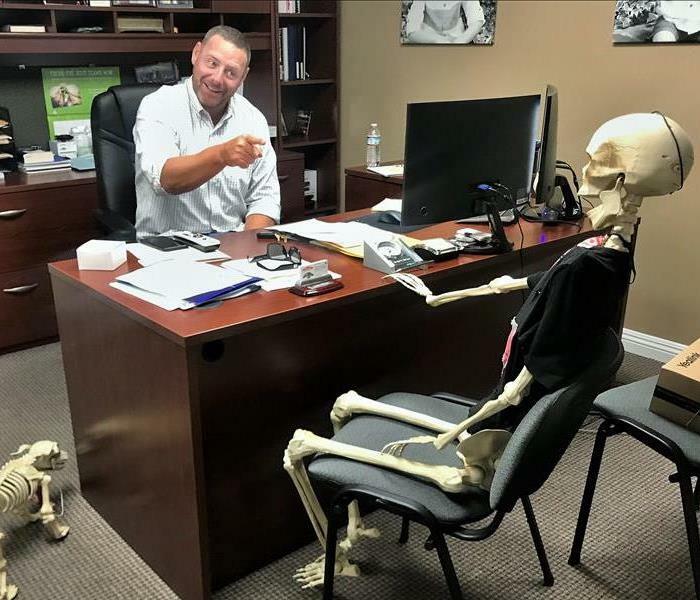 Even while we sleep, you can be assured that the skeleton crew is always monitoring operations and making sure that SERVPRO is ready to respond and make disasters "Like it never even happened." Large blazes often result in extreme destruction to a building as witnessed by this Irwindale fire. The extensive fire damage requires our SERVPRO technicians wear respirators, hard hats, and more PPE personal protection equipment. This is a long and hazardous process that always comes to the planned outcome when done by SERVPRO. This photo shows a clear day in the San Gabriel Valley after many days of intense rains, flooding, mudslides, and hail. 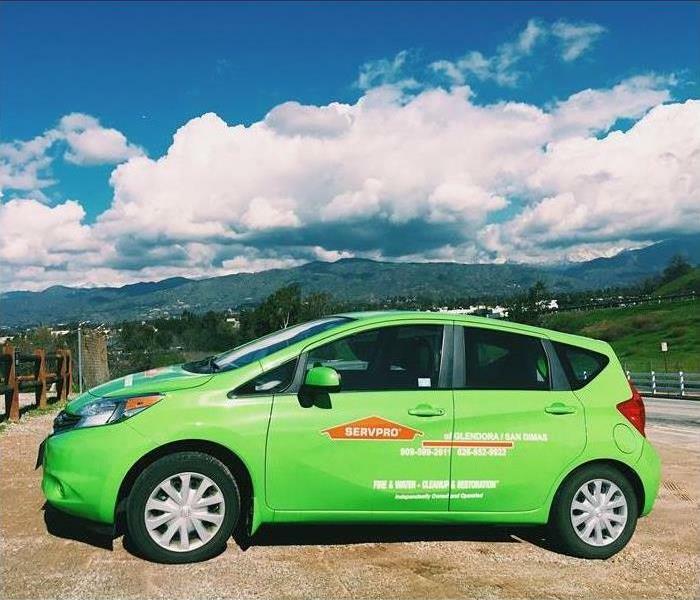 The SERVPRO of Irwindale/Baldwin Park sales car was out and about in the community under a blue sky. One of the major reasons to dry water soaked materials quickly is to prevent permanent damage caused by fungi. Molds, mildew, and bacteria are responsible for the decomposition of organic material. SERVPRO of Irwindale/Baldwin Park has a team of highly trained mold remediation specialists to take care of any mold problem in your commercial building or home. Mold can produce allergens and irritants, so if you suspect mold in your home, don’t hesitate to call SERVPRO of Irwindale/Baldwin Park at (626) 337-3374. 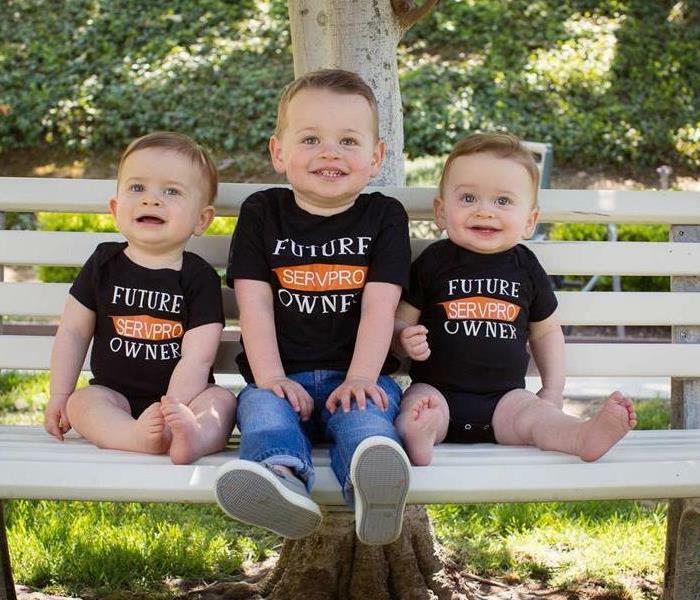 Colton, Finn, and Parker are our ones to watch this year at SERVPRO of Irwindale/Baldwin Park. In their short time here, they have proven that they can handle any Residential or Large-Loss Disaster in the San Gabriel Valley or LA Basin. Their expertise and professionalism is an asset to this franchise so expect great things from them in the future. 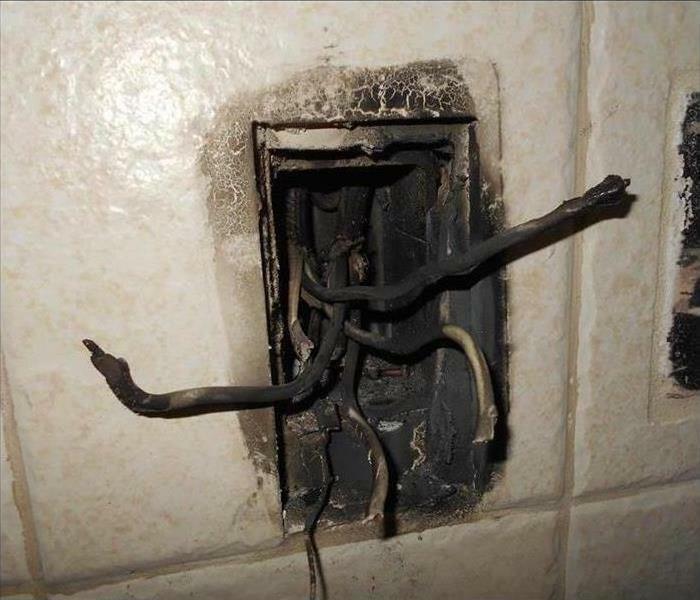 The photo shows the aftermath of an electrical fire in a two story apartment building. The fire started in a unit on the second floor and affected the entire unit. 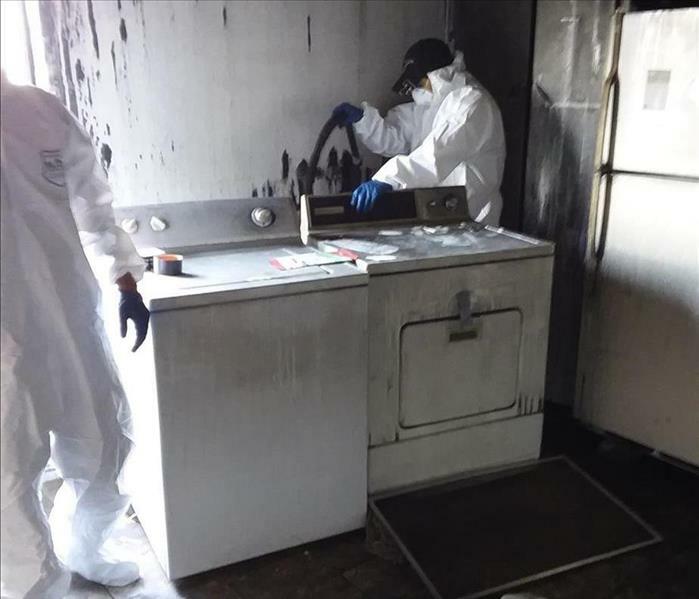 All contents were deemed a total loss and SERVPRO of Irwindale/Baldwin Park was called to provide smoke remediation and deodorization services. If your home suffers from smoke or soot damage, do not hesitate to call SERVPRO of Irwindale/Baldwin Park for all of your fire restoration needs! Sometimes when a storm hits and rain water begins accumulating, it can affect not just the inside of a house, but underneath as well. 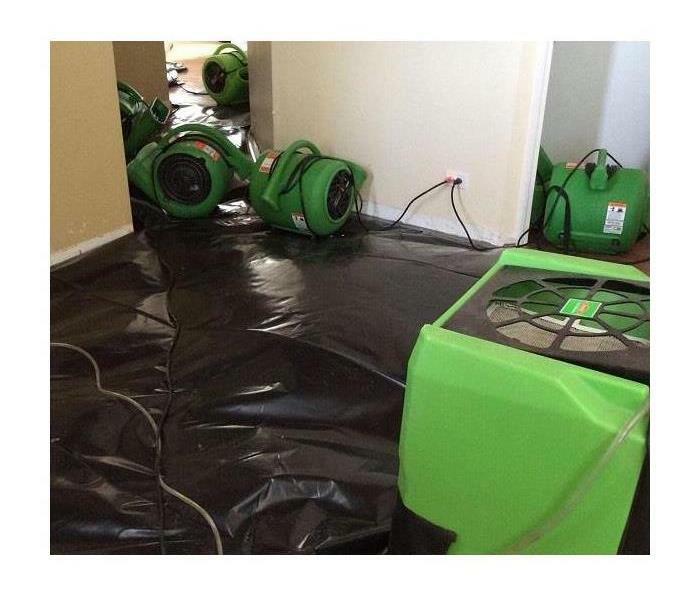 SERVPRO of Irwindale/Baldwin Park provided drying for flooding occurring under the floor of a home due to a storm. 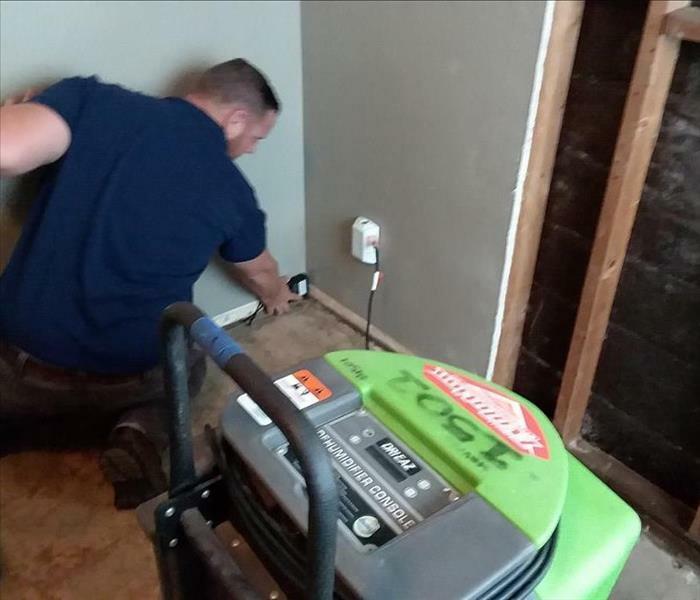 SERVPRO of Irwindale/Baldwin Park has a team of water damage restoration specialists ready to restore any home in the San Gabriel Valley back to pre-water damage condition. Our crew quickly extracts the water and then dries all affected materials. To ensure that the property is dry, SERVPRO of Irwindale/Baldwin Park uses moisture monitoring equipment to effectively measure and document the drying process. At SERVPRO of Irwindale/Baldwin Park, we understand the stress and worry that comes when your home or business suffers from fire damage. Our team has specialized fire damage cleanup and restoration training and experience to quickly restore your home to pre-fire condition. If anyone’s team can restore your property “Like it never even happened.” Joe McCann’s can! Call us today at (626) 337-3374! 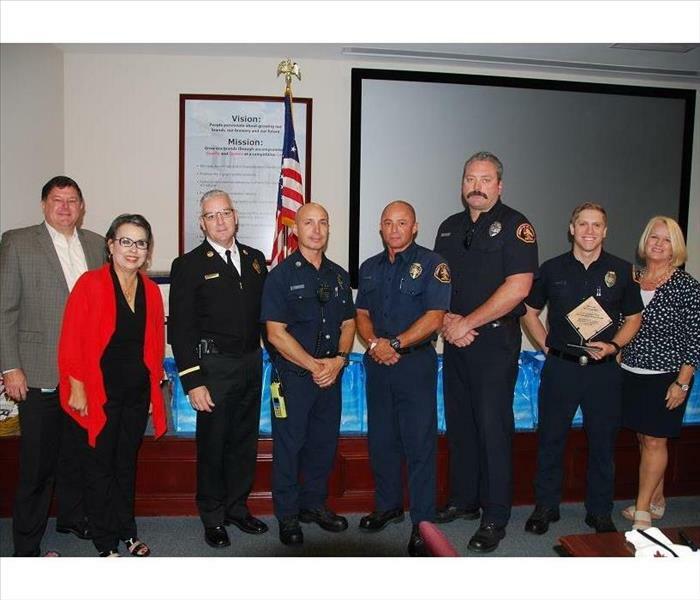 First Responders in LA County are recognized by the City of Irwindale. SERVPRO of Irwindale/Baldwin Park continues to be involved in the communities in and around the City of Los Angeles. Helping celebrate the First Responders at this Event sponsored by the City of Irwindale, Irwindale Chamber of Commerce, MillerCoors, and Southern California Edison was important and an honor. We salute these men and women who confront individual and widespread disasters with professionalism and courage every day, in spite of possible danger to themselves. In this photo, we see our franchise owner Joe McCann using a moisture meter to monitor affected materials of a water loss. This local Glendora home suffered from a water loss and the SERVPRO of Irwindale/Baldwin Park team was able to dry all affected materials quickly and efficiently. Call us today at (626) 337-3374! A commercial property’s appearance is very important for their business. 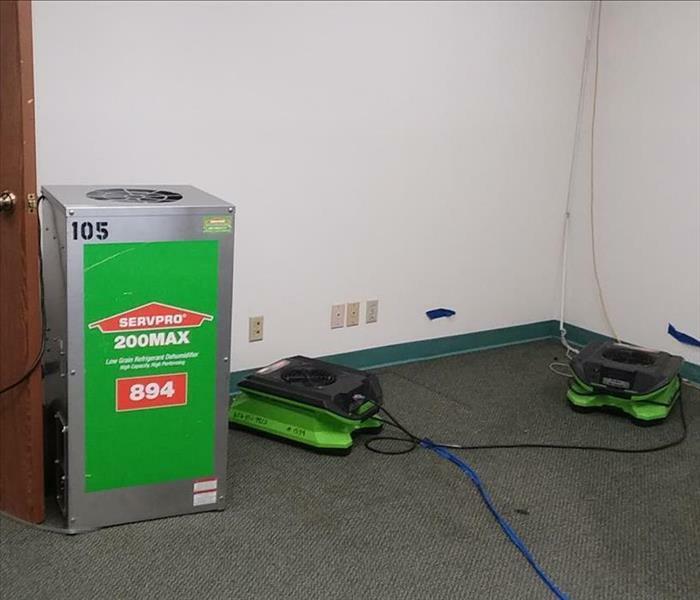 When the need arises for professional cleaning or emergency services, SERVPRO of Irwindale/Baldwin Park has the training and expertise to help make it “Like it never even happened.” This photo shows an air scrubber placed in a commercial building to help purify the air. When dirt, odor, and moisture challenges go beyond the scope of your regular janitorial staff, don’t hesitate to call SERVPRO of Irwindale/Baldwin Park. Colton, Finn, and Parker are the first line of defense to handle any Residential or Large-Loss Disaster in the San Gabriel Valley or LA Basin. 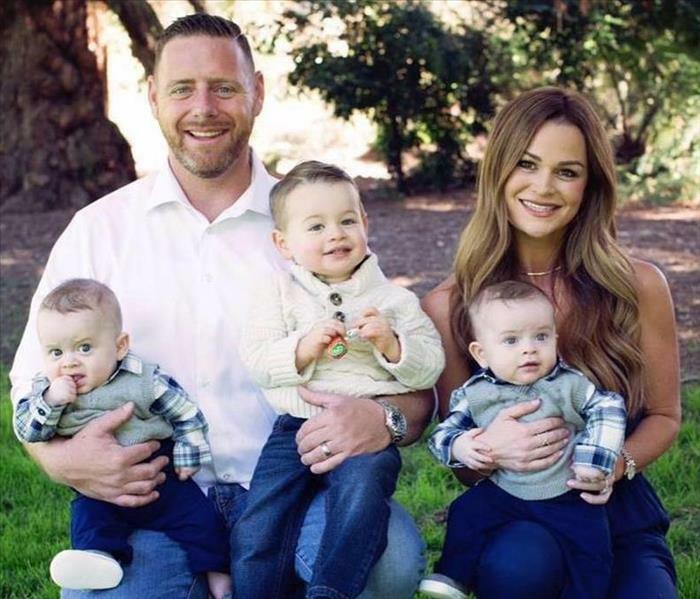 Joe and Dani McCann are owners and operators of SERVPRO of Irwindale/Baldwin Park and their three boys help provide the assurance and motivation our customers will get a professional and timely response when restoration services are needed. Staying in business by providing quality service is a family tradition. Life is good! Irwindale Mayor, Mark Breceda Wins! 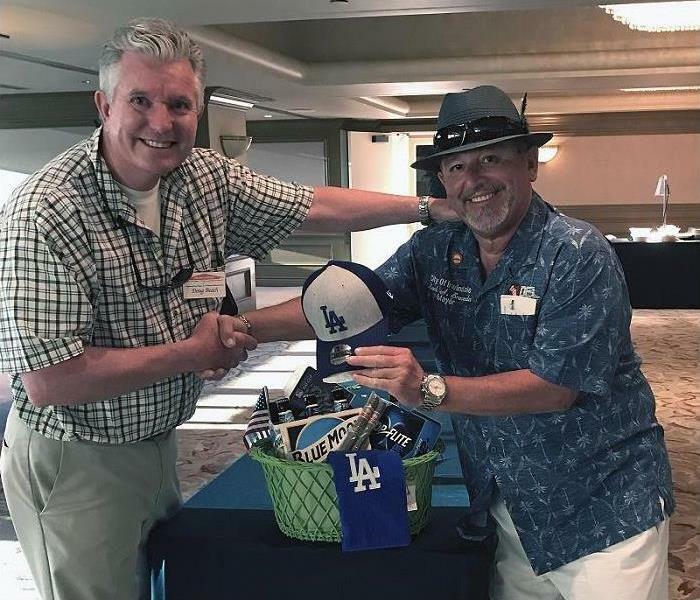 At the City of Irwindale's 37th Annual Chamber of Commerce Golf Tournament in May, SERVPRO of Glendora/San Dimas & Irwindale/Baldwin Park put tickets into a drawing for a very cool raffle basket containing Los Angeles Dodgers apparel and golf accessories. All the donations went to the Relay For Life Cancer Fundraiser. The winning ticket was drawn at the end of the day during the Event Dinner. The winner of the Raffle turned out to be the Mayor of Irwindale, Mr. Mark Breceda. Congratulations Mayor Breceda and thanks to all the participants. Every year, SERVPRO of Irwindale/Baldwin Park, participates in various community events. Among our favorites, is the American Cancer Society, Relay For Life fundraising event. Each year in the Spring, businesses and residents from Glendora and San Dimas California, come together to recognize those affected by Cancer either as a personal experience, or that of a loved one or friend. Contributing to the research efforts by collecting donations and displaying the spirit of giving is a fundamental part of our business philosophy and core values. In the photo is "SERVPRO Joe" McCann, our franchise owner, posing in this year's entry in the "Road to Recovery" cardboard car race. The event is a symbol of the important work of helping cancer patients get to and from life saving treatments who might otherwise not be able to make their appointments. 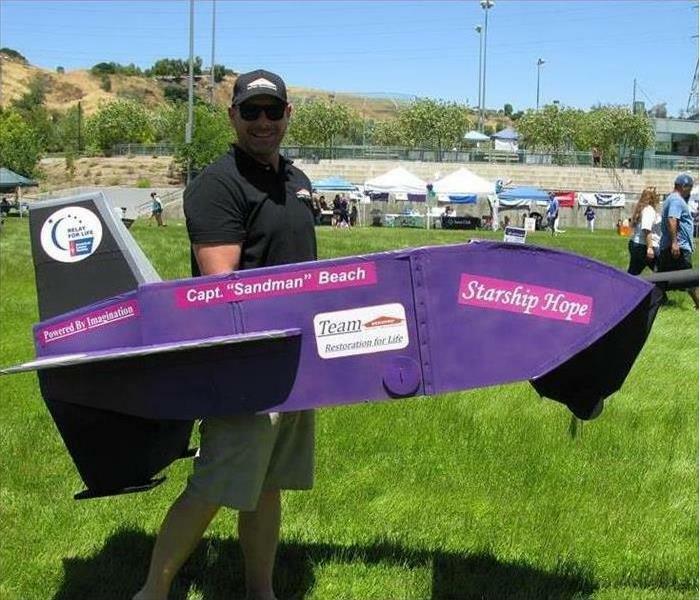 "Starship Hope" did not win the race, but it did get best in show! When you find mold in your house, as shown in the photo, call the SERVPRO of Glendora/San Dimas & Irwindale/Baldwin Park team to help assist in restoring your home, making it "Like it never even happened." SERVPRO of Glendora/San Dimas & Irwindale/Baldwin Park was called to this local Southern California commercial building to provide water damage services. The photo shows our drying equipment being used to help get the moisture out of the air so this business can resume normally. Be sure to call SERVPRO of Glendora/San Dimas & Irwindale/Baldwin Park for all of your restoration needs. 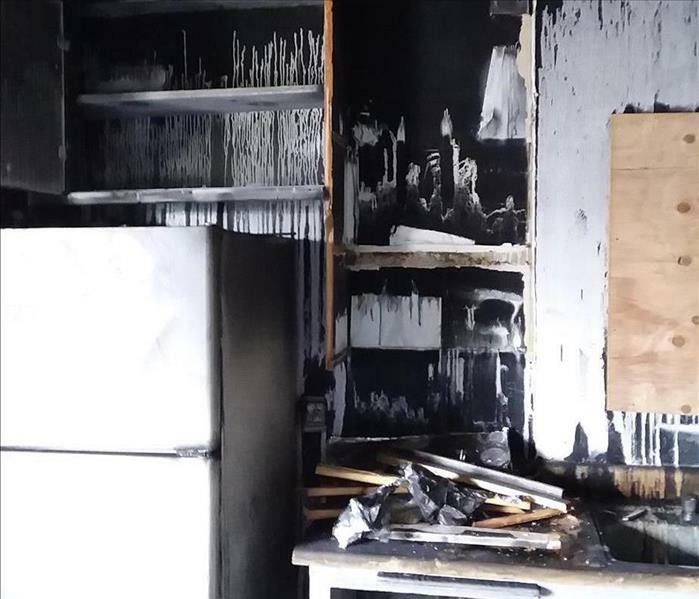 A San Dimas resident suffered from fire damage due to an outlet shortage that caused a fire. SERVPRO of Glendora/San Dimas & Irwindale/Baldwin Park was called to provide fire damage remediation services such as removing damaged material and cleaning up resulting smoke damage. SERVPRO of Glendora/San Dimas & Irwindale/Baldwin Park is a leader in storm and water damage restoration. In the event of a major storm or disaster, our team has access to resources from 1,700 Franchises across the U.S. In the photo, we can see how our SERVPRO crew put tarps on a roof to minimize damage to the interior of this Southern California home. Here at SERVPRO of Glendora/San Dimas & Irwindale/Baldwin Park we invest in the latest technology and equipment to aid in restoring any property as quickly and efficiently as possible. We utilize industrial-grade dehumidifiers help prevent secondary water damage like swelling and warping of floors, walls, and furniture. We also use high-speed air movers which create airflow across walls, carpets, pads, and furniture. This was the aftermath of a garage fire in El Monte, CA. As you can see, fires can cause much damage and your contents could look like they are ruined forever. Here at SERVPRO, our main goal is restoration and not replacement, so we will work towards cleaning and restoring the items in your home. House fires can put life on hold, but SERVPRO of Glendora/San Dimas & Irwindale/Baldwin Park is here to help your life resume. A commercial building in Orange, CA suffered from fire damage earlier this year. The photo shows a crew member at SERVPRO of Glendora/San Dimas & Irwindale/Baldwin Park performing a white towel test to see if the affected area has been cleaned thoroughly. At SERVPRO of Glendora/San Dimas & Irwindale/Baldwin Park our technicians use personal protective equipment so that they are not exposed to certain contaminants. 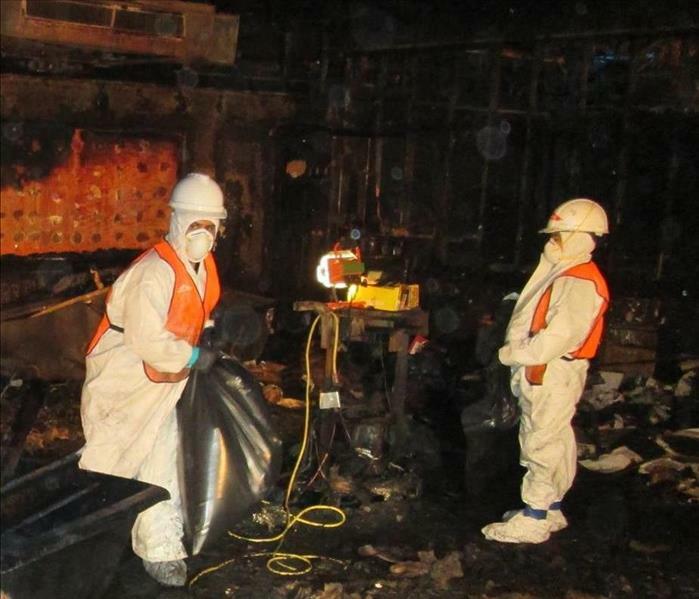 In the picture, our crew member is seen wearing a full-face respirator and full body suit to protect against mold exposure which could cause respiratory issues. This La Verne, California home suffered from storm damage which resulted in a roof leak. The leak affected the ceiling walls and flooring in the bedroom and the ceiling in the garage. The picture shows the water damages that can be caused due to a storm. If your home or residence suffers from storm damage, don't hesitate to call SERVPRO of Glendora/San Dimas & Irwinale/Baldwin Park. The SERVPRO of Glendora/San Dimas & Irwindale/Baldwin Park team has the specialized training needed to restore your home to pre-fire condition. Here at SERVPRO we focus on restoring as opposed to replacing because restoring your property is substantially less costly than replacing those items. As you can see in the photo above, our team is working to restore this fire damaged residence to preloss condition, "Like it never even happened." SERVPRO of Glendora/San Dimas & Irwindale/Baldwin Park was called to this commercial building in Orange, CA to provide fire damage remediation services. As you can see in the photo, our team works cohesively and thoroughly to ensure that every affected area gets cleaned as quickly and efficiently as possible. Do not hesitate to call SERVPRO of Glendora/San Dimas & Irwindale/ Baldwin Park for all of your restoration needs. Insulation can be a reservoir for mold. Anytime there is insulation that is exposed in your home, it should be checked thoroughly for mold. In the photo, we can see an example of mold in insulation found in a Southern California home. If you find mold anywhere in your residence or business do not hesitate to call SERVPRO of Glendora/San Dimas & Irwindale/Baldwin Park. 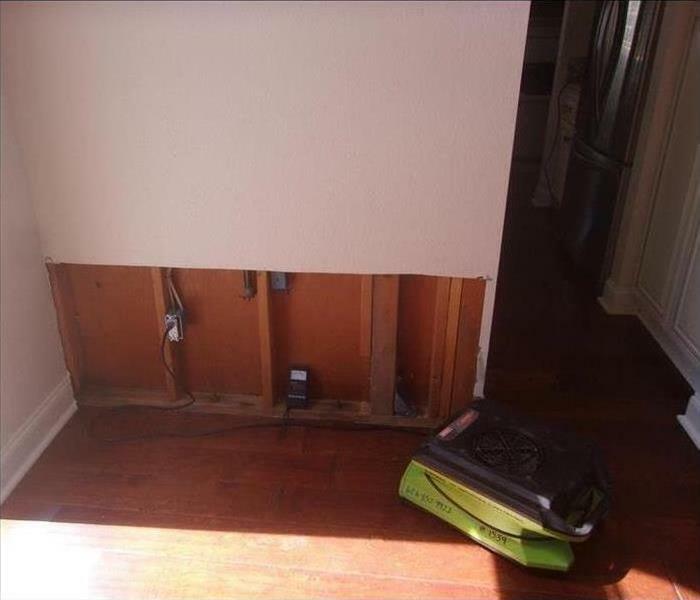 When your residence or commercial property suffers from water damage, SERVPRO of Glendora/San Dimas & Irwindale/Baldwin Park has the expertise and equipment to properly restore your property. In the instance of water damage, our team uses the non-invasive moisture meter, seen above, which helps identify moisture in non porous materials. Storms can be a reoccurring problem in the San Gabriel Valley and LA Basin. 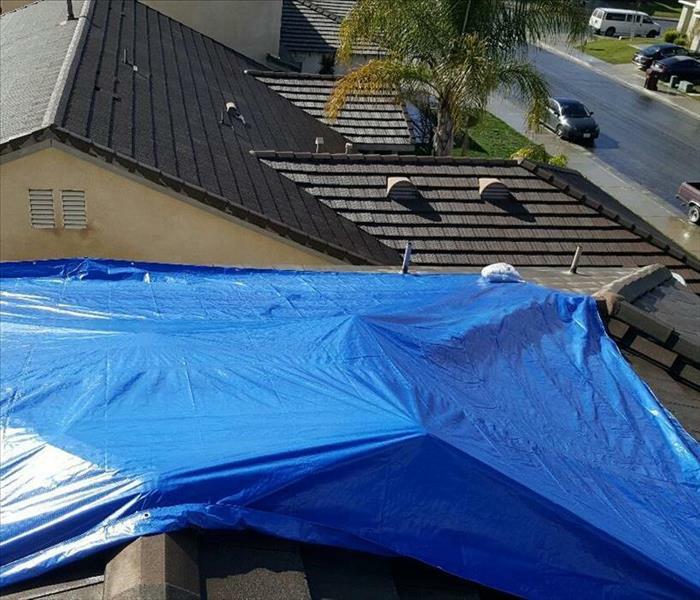 During a storm, SERVPRO of Glendora/San Dimas & Irwindale/Baldwin Park can assist by putting temporary covers on the property until the roof leaks can be properly fixed as you can see in the photo. After a storm, the SERVPRO team can clean-up any water inside of the property that may have been caused by heavy rains. A local San Dimas business suffered from extensive water damage due to a pipe leak earlier this year. The SERVPRO of Glendora/San Dimas & Irwindale/Baldwin Park team worked quickly and diligently to ensure that the business did not have to close and interrupt service to their customers. Carpet delamination occurs when the secondary backing on the carpet separates from the primary backing. 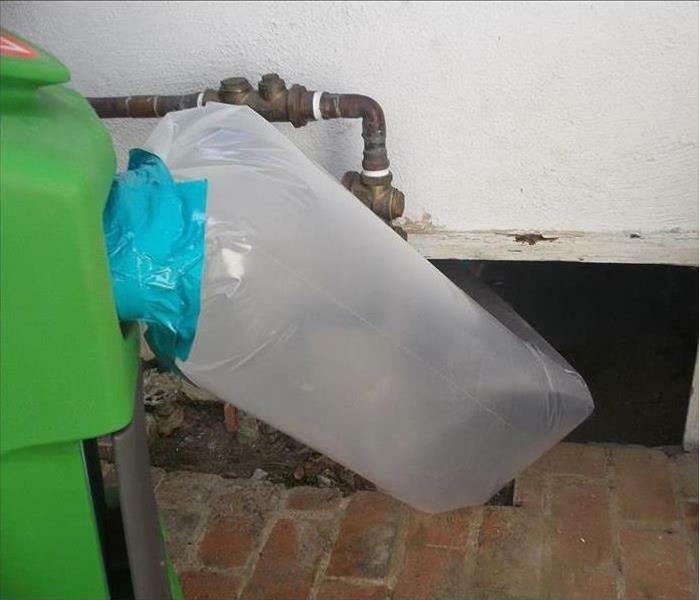 In this instance, the cause of the carpet delamination was a broken water heater in this San Dimas residence. Extensive exposure to water causes the carpet materials to deteriorate and make the carpet unsalvageable. 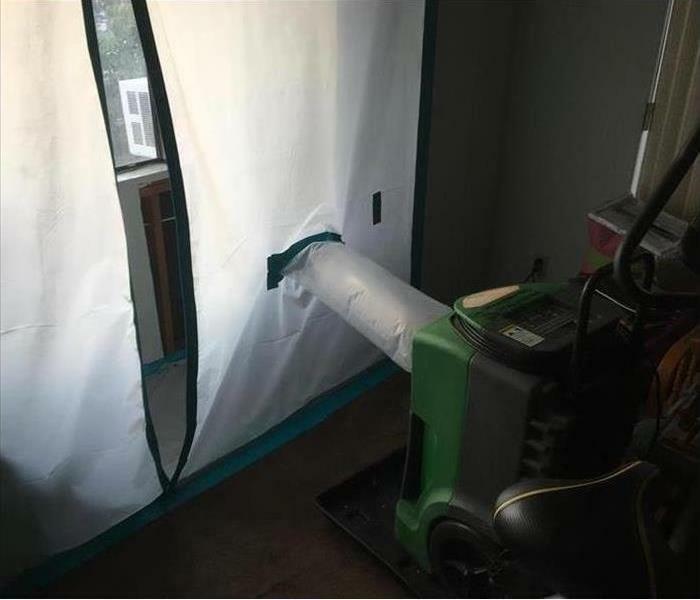 If this ever happens in your residence or business don't hesitate to call SERVPRO of Glendora/San Dimas & Irwindale/Baldwin Park. A Baldwin Park home suffered from water damage which resulted in visible mold in the home. The home owner contacted SERVPRO Glendora/San Dimas & Irwindale/Baldwin Park to remove damaged material and mitigate the mold. When mold is discovered, often a barrier is placed between the affected area and the rest of the home. After a Corona home suffered from a pipe bursting, a kitchen ceiling and dining room walls were affected with water damage. SERVPRO of Glendora/San Dimas & Irwindale/Baldwin Park were called to provide removal of affected material and providing drying until moisture level returned to normal. SERVPRO of Glendora/San Dimas & Irwindale/Baldwin Park is associated with the Citrus Valley Association of Realtors (CVAR). Annually, we participate in the "Summer Kick-off" event hosted by CVAR to bring business owners together for some fun and networking. SERVPRO was a House Sponsor again this year and had a raffle with Fourth of July gifts. The Winner of our drawing was Ms. Maria Rondomanski. Congratulations to Maria and Family and have a great Summer! Most of the time the damage caused by fire is visible as a direct result of the heat and flames. However, there are times when the damage is from the debris that comes from the fire in the form of fine particles in the smoke. The attached picture is of a car (late Model S Tesla) with a white paint job. 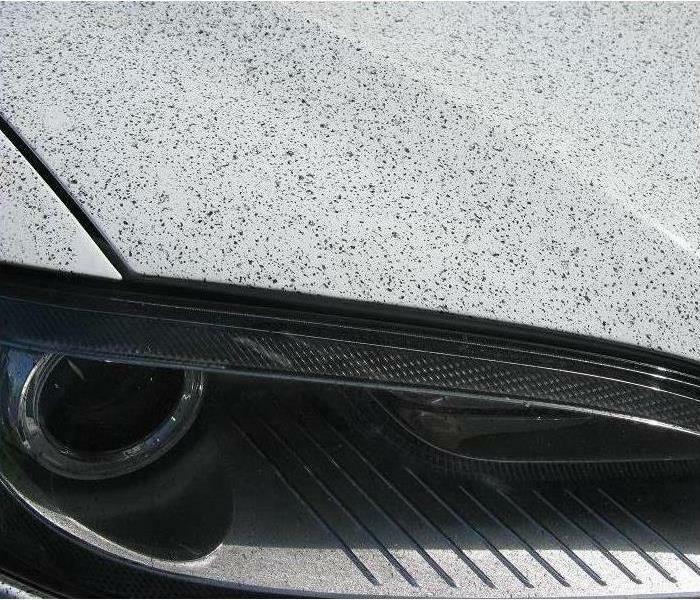 You can see the black soot from the fire that has settled on the paint. The fallout from the fire was created from stacks of plastic 4'x6' PVC flower bed trays melted down by the fire. The particles rained down on the all the cars in the area as the hot air from the fire cooled and settled back to the ground. SERVPRO helped with the specialty services required to clean up the cars affected by this disaster too. Man Against Nature in So. Cal. Southern California goes through a predictable Winter Rain and Summer Fire cycle every year. The Fall and Winter Rains combined with mild temperatures provide a great growing season for plants, and, the arid climate and Summer heat then quickly dries out the ground cover making it perfect fuel for fires in the foothills. When the fires burn off the ground cover, the soil loses the stabilizing plant roots. The soil is then easily washed away as mud during the following Winter runoff. 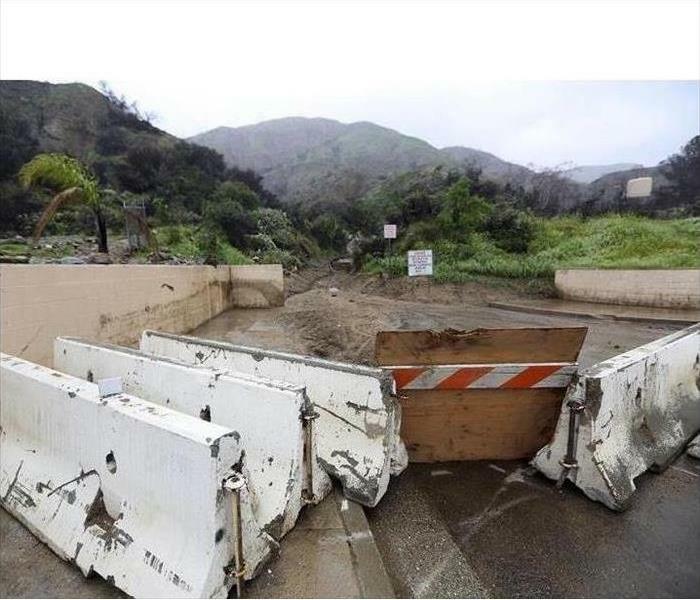 K-rail, sand bags and other barriers are set up in the Winter of 2016 to block the flow of mud in a wash above Melcanyon Road in Duarte, Calif., a threatened area below a San Gabriel Mountains burn area known as the Fish Fire. As a "Large Loss" Franchise SERVPRO of Glendora/San Dimas & Irwindale/Baldwin Park have the resources to help whole communities with Emergency Services when Southern California needs help digging out.